It’s always difficult to raise up your head after a 7-0 Champions League disaster. In the space of 72 hours, Schalke 04 had been out of the Champions League, lost their manager and needed to be ready to face one of the Bundesliga’s toughest opponents. It’s a nightmare-like end for a disastrous period that the Royal Blues have known for a few weeks. On the opposite side, the Bundesliga’s third team arrived confident to the game, not only due to their opponent’s current shape but also due to their recent history. The Red Bulls have won their last four away games and have not lost for two months. Presented like that the Leipzig team seemed to be a large favoured team. Huub Stevens, Schalke’s new manager, made the choice to maintain a quite identic structure to Wednesday’s one. He started with Nübel over Fährmann and Stambouli was positioned higher on the pitch as a defensive/central midfielder. Nastasic was the third central defender. 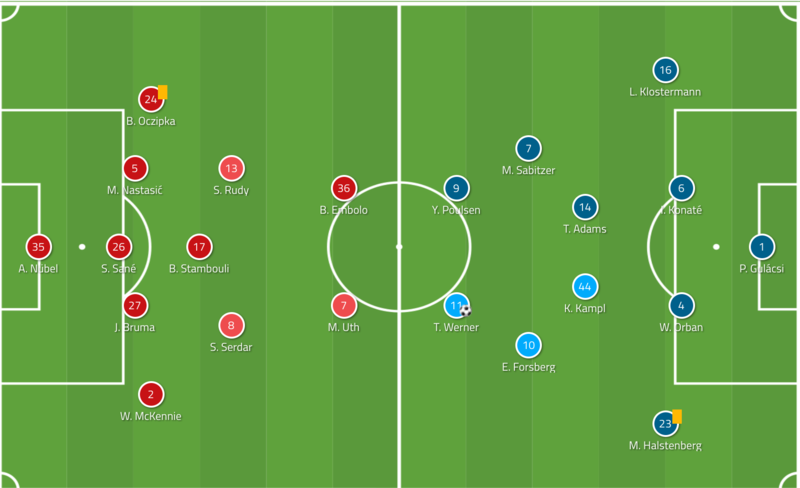 On the other side, it was a classic 4-2-2-2 from Ralph Rangnick that will take different shapes according to the movements of the ball and the opponent. The first thing to say about this is that the game saw huge intensity from both teams at the beginning. Schalke scored a goal (disallowed a while later) with their first attack after an amazing effort from Weston McKennie. This goal’s action seemed, at first sight, to be a typical attacking start for the visitors during the game. As I said, Schalke started the game with three central defenders. This structure, which became more and more common during the last few years, does offer the advantage of multiple pass options during the first step of the build-up and does facilitate the breaking of the opponent’s first attacking line. This is particularly true against a team which plays with two forwards. It can also function perfectly against a 4-3-3 or a 4-2-3-1 team when you make good use of its goalkeeper and midfield trio. (remember that Barcelona vs Betis game at the Camp Nou?) Well, as seen in the picture below, Leipzig pressed the locals in a 4-3-3 structure leaving all of Schalke’s three midfielders unavailable for receiving a pass. However, Sané took advantage of this pressing. As Bruma stepped back with Forsberg stuck to him, a breaking-line pass opened up to McKennie who dribbled four opponents in a diagonal run. Unfortunately for Schalke, their disallowed goal was the first and only well-built attack during the first half. It’s also one of the rare times where they got over RB Leipzig’s pressing using combination play. It may not be the most noticeable detail but, for me, there was a problem concerning Bruma’s “body orientation” when receiving the ball in the first half. In the pictures below, the Dutch defender had, most of the time, his back to the sideline and was looking in the direction of the passer. He did not manage to identify any of the opponents’ coming to press him. He did not orient his body so as to look for forward pass options. This attitude resulted in multiple back passes to Sané, and mostly to the goalkeeper who then played inefficient long balls. For a better comprehension of this, you can compare Bruma’s and Nastasić’s body orientations. The Serbian defender always has his back to his goal and manages to identify opponents and space. 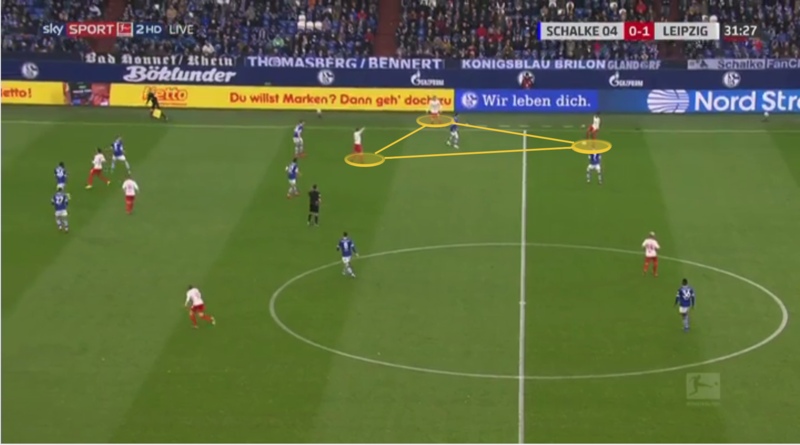 Progression through the flanks is the next thing that constrained Schalke. 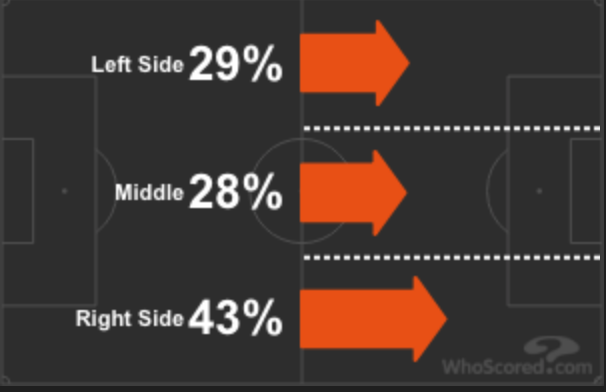 The connections between side-back, midfielder and the nearest centre-back to them have varied from poor to inexistent. 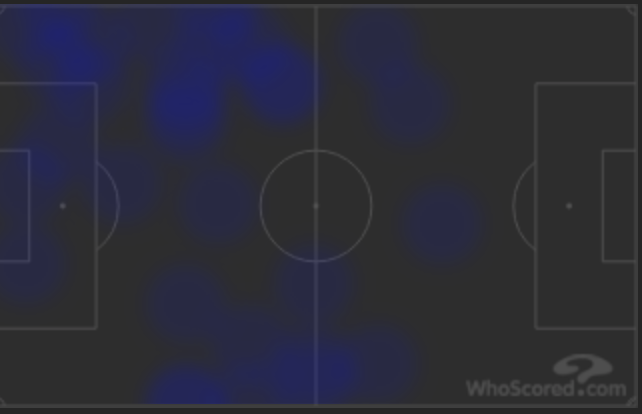 When you look at the right side of the pitch, from where Schalke attacked the most, you notice two things. McKennie received most of the passes from Sané and not from Bruma, who was often over-shadowed by Forsberg when McKennie had the ball. Serdar was either far away or behind the American youngster. The visitors, at the opposite of the Royal Blues, had entered slowly and calmly through the game. They did manage to create danger at multiple times and had prevented their opponents to do so. Leipzig defended quite high with a first pressing line positioned over 60 meters from their own goal. The whole team managed to move according to the position of the ball and the opponent. They tried to block passing channels, especially those to the centre, by keeping Schalke’s midfield trio under pressure. On the offensive side, RB Leipzig had the most interesting structures seen in the game last Saturday afternoon. The first thing to note about Leipzig’s offensive players is their extraordinary mobility and position changing. 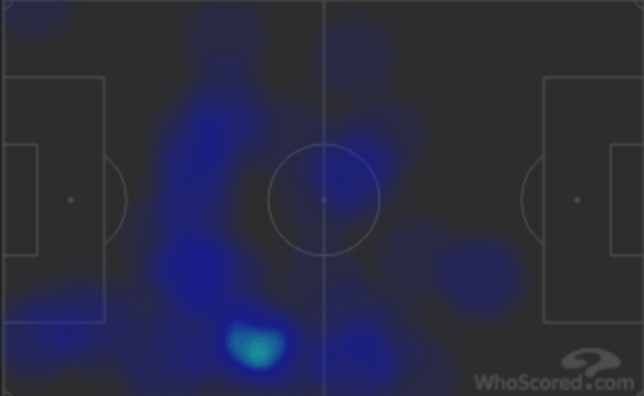 In the heatmap below, Forsberg, who is a left midfielder on paper, covered the whole width of the pitch. Kampl was also present in the central lane alongside both sides despite being essentially positioned on the left. Finally, Timo Werner, the team’s main striker, roamed from position in many situations. This offered, in general, multiple pass options especially while attacking one flank. 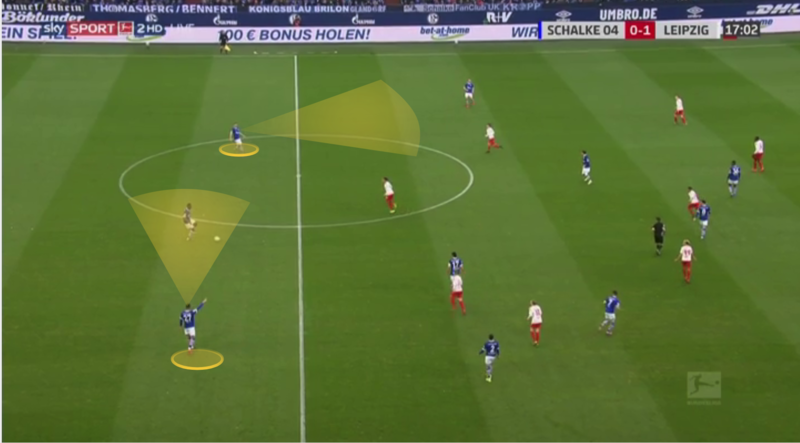 The major thing to notice is that contrary to Schalke once again, they had at least two pass options when having the ball close to the sideline. This is due to multiple factors. Firstly, the ball holder, when being on one side, does not stick to the line. In fact, he always carries the ball two or three meters from the sideline so that at least two team-mates can occupy the spaces left: to his left and to his right. Indeed, when holding the ball a few meters from the side-line you compel your opponent to put at least three players in a very small and isolated area of the pitch to close you down. When the latter does so, spaces open up in the centre lane or, if they remain compact, on the other side of the pitch. This was not even the case for Schalke during the first half. Schalke deployed only three players when defending an attack from the right side, for example. The right midfielder tries to block the opponent’s ball carrier, the left full-back alongside the central defender was covering two other players. The wings’ change made by Forsberg and the stepping-back by Werner turns out to be crucial at this point. When the visitors started an attack on either side, using three to four players, they directly found themselves in a numerical superiority situation. It’s clear that some things did change during the second half for both teams. Ralph Rangnick did move to a something like 4-4-2 structure while pressing Schalke. His first defensive line dropped 10 to 15 meters back. However, the changes made by Huub Stevens weren’t accompanied by risk-taking. Schalke had more pass options in the direction of half-spaces. Nastasić tried to look for midfielders especially when RB Leipzig moved to a 4-4-2 shape while defending. There was also more availability for full-backs on the flanks. Nonetheless, those individual ball calls and stepping-back were, in general, not followed by coordinated collective moves. The locals did not have to break a first high defensive line but problems weren’t solved for them. 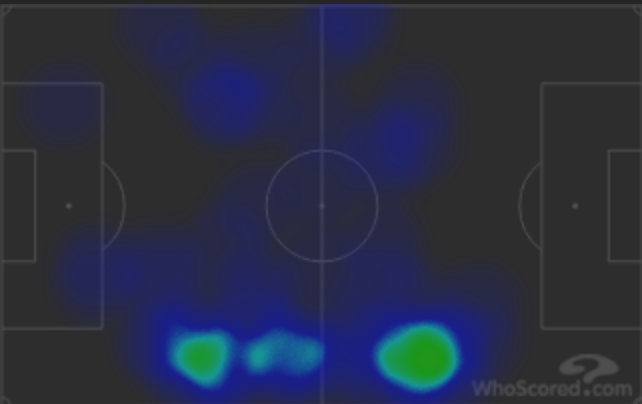 They continued to rely mostly on long balls as they did earlier on the game. They did not succeed to dominate their opponent in terms of position or rhythm. On the one hand, the space separating the defensive and the midfield’s lines were huge during the second half. Furthermore, the use of three central defenders disabled the team. 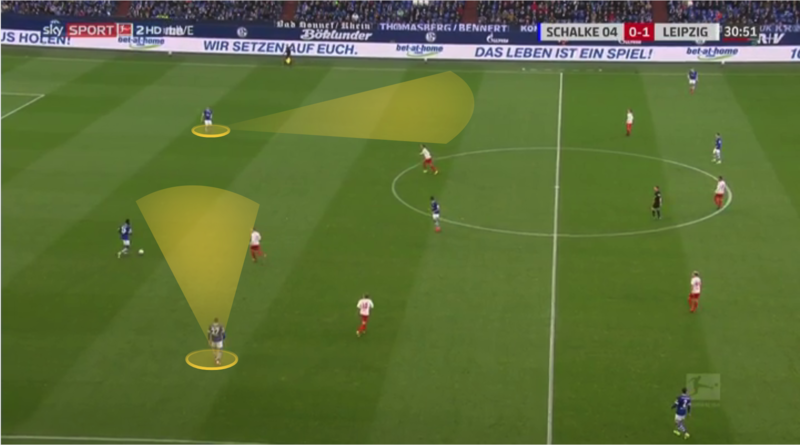 When an attack starts from Schalke’s defence, there is one defender who either carries the ball or makes a forward pass, the other two step back and rarely participate in the attack. This meant that Schalke had at least a deficit of two players in the attacking phase. This also meant that progression through the centre lane was inaccessible as only one midfielder occupied the centre of the field with little support around him. This can be seen through the statistics below. To resume this, the locals did not have to break a high defensive line anymore. They failed to solve other problems as they did not ensure moving the ball forward during the next steps of build-up. Overall, Schalke’s players tried their best to reconcile their fans after a horrific night at Etihad Stadium. It’s understandable that collective offensive movements were not in place. Their use of three central defenders can certainly be improved. I will personally retain that the Red Bulls were more convincing and a bit more entertaining to watch than their opponents during this match despite not continuously dominating the locals. For the moment, 2018/2019 is Leipzig’s best Bundesliga campaign ever. Progress in maintaining intense rhythm and sustained threat on their rivals can be the key to becoming one of the title contenders in the next few years.